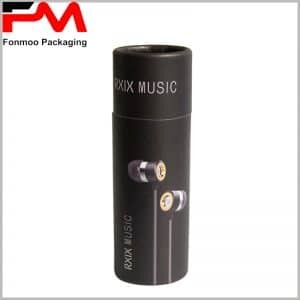 If you are a fabricator or trader of electronic goods, one thing that you may concern is to find a good packaging box for your smart watch as to protect it and attract clients, and here is a nice tube packaging boxes dedicated to this aim. This tube packaging box is exclusively designed for electronic devices packaging, especially for children’s smart watch, to achieve the best protective and commercial effect. First of all, the material chosen is of very high quality: 450g SBS as the main body and 105g double chrome paper along with white EVA sponge for inner protection. The density of paper itself can explain the quality, what’s more, a double chrome paper is smooth on both sides, giving superb visual and touching feelings. As for the EVA part, on the middle of the EVA, there is a little curved ledge as to let customers take out the product easily, a little design for convenience. Having been fabricating tube packaging box for years, we are professional and can provide you all kinds of such package. Just get in touch with us and explain your needs, then we ensure you that we will offer you with best condition and price such children’s smart watch tube packaging boxes as you demand.